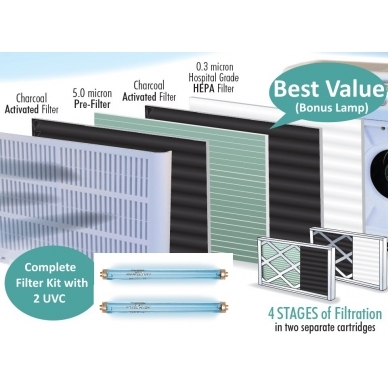 Best Value: Complete BONUS Replacement Kit including Stage 1 Filter, Stage 2 Filter, and 2 UVC germicidal lamps for the Field Controls TRIO 1000P or TRIO 1000P2 Portable medical grade HEPA air purifiers. 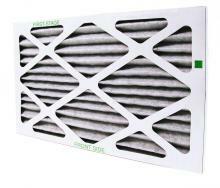 Recommended to replace filters every 12-24 months and the UVC lamp every 12 months depending on usage. Includes 2 filter cartridges that contain the Activated Carbon with Prefilter in one cartridge and the other one contains the Activated Carbon with Medical Grade HEPA. Plus 2 UVC germicidal lamps. BEST VALUE: This is an excellent value. For only an additional $11.73, instead of $42.17, you'll receive an extra UVC lamp. 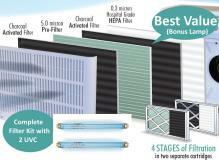 Most Popular: This is most for people who want to save money, change their other filters less frequently than every 12 months, and/or want an extra UVC lamp on hand. 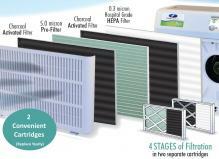 Filter Life: Recommended to replace every filters 12-24 months and UVC lamp every 12 months depending on usage and the contaminants in the air. 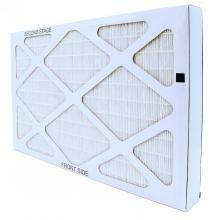 Pre-filter removes particles as small as 5 microns.